We are a fast growing independent car and van service company based in Monasterevin. We provide a friendly, professional and quality service. By using state-of-the-art equipment, we can quickly and accurately pinpoint your auto repair needs on all makes and models of vehicles. Need tyres, auto service, wheels or brakes? Visit our CarMax Center location serving the Kildare and Laois area or contact us online anytime. 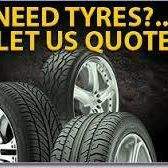 Servicing all makes of Cars and Vans,Tyre Centre huge selection of Tyres in stock.